It’s been hot. I’ve been trying to get the weeds pulled and the seeds planted. The dandelions have taken over. I like dandelions. I pick the young leaves and add them to salads and chop them into sautés. 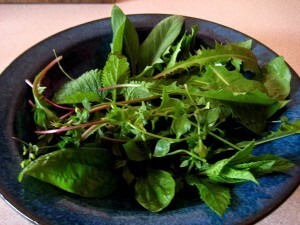 I juice them along with chickweed, lemon balm, and plantain leaves. I snip wheatgrass and mint into the mix too. But the dandelions are insistent this year, so I’m letting them take over one section of the garden. I water them and thank them for coming to feed me. I’m pretty sure that if things got really bad in our present day world I’d find enough food to eat right here in my yard. It’s a grim thought, but the more I discover that not only our food and water sources, but practically everything we make, consume, and depend on in this country is compromised in some way, the more I wonder about us as a people and a nation. I wonder if I really belong here. Should I leave, desert a sinking ship so to speak? Really, I think about it sometimes. We don’t even treat our fellow human beings as real people with real needs, needing things like a living wage to simply afford the basic necessities. I lived in Sweden in the 1970s, when its Socialist agenda was in its heyday. Olaf Palme was Prime Minister. He’d sometimes walk home to his apartment after a hard day at the Riksdag, wending his way through the streets of Stockholm, greeting people as he went. He even rode the subways like other normal working people. It was really a pretty idyllic society, good intentioned. Sweden lost its innocence when Palme got shot coming out of a movie theater with his wife one night, a place I had been to countless times. Sweden wasn’t perfect by far, but people mattered—children mattered, women mattered, the unemployed and the sick mattered—and as far as I can see they still do. There were no poor people in Sweden, everyone got what they needed. The Scandinavian countries of Sweden, Denmark, Norway, Iceland and Finland all lived by the same ideals, that no one should be without the basics: food, shelter, clothing, education, healthcare. Things were affordable, such as housing and food, and a lot of things were free, paid for by the high taxes we all paid, but I always felt it was a great deal. You got what you paid for; it was pretty real in that way. The government delivered on its promises. As an immigrant I received the same benefits as a natural Swede. From day one I had my health card and access to free education. I took free Swedish language courses through a variety of schools, including the University of Stockholm. You had a sense that the government was just like you, the Prime Minister just another working guy, and that you were really cared about. An overall sense of social justice, responsibility, compassion and respect for fellow human beings prevailed that I have rarely experienced since, especially on a governmental level. The cold people of the north—as they were sometimes referred to—had warm hearts at their center. As a society they were not selfish or greedy. Memories of their own recent history of hard times were still raw and still talked about. Human suffering became the most important matter to address and they found a means of relief. There were a lot of problems too, the homogenous population was fast changing and new difficulties loomed on the horizon, but overall there were few complaints. Everyone mattered. I noticed one of those obnoxious polls the other day: The Most Democratic Countries in the World! I couldn’t help myself; I had to look. The U.S. got a mediocre ranking, 21 out of 25, but guess who was at the top: Norway, followed by Sweden, Denmark, and Iceland. I wasn’t surprised. Back in the 70s, Norway was the first of those countries to ban certain food colorings and preservatives because they were deemed carcinogenic and how could you feed your people something that was poisonous! With no food coloring, things looked kind of unappetizing. It was most noticeable in the street vendors selling gray hot dogs and sodas that were clear in color. We still haven’t banned food colorings and preservatives from foods, in fact we’ve simply renamed them. And as for feeding people carcinogens, don’t worry, there’s plenty to go around! As I said, I try not to think about these things, but I can’t help wondering when the greed is going to be stopped so REAL can become the norm again, when the new buzz word is REAL and it really is REAL! The Buddhists say to accept ignorance and have compassion. The Shamans of Ancient Mexico say that life is an illusion anyway, so why fixate on it. Both of them say work to free yourself. And so I work to free myself from my own ignorance and from my own illusions. I refuse to get caught in the fear and the worry that comes so easily whenever I think about the earth and the world we have created. I see it as my duty to work on myself, to free myself of the corporate greed, to detach as much as possible from what seeks to draw me in. I decide what I really need and what I can do without. And so, in keeping with that decision to energetically detach as much as possible, I canceled our cable TV. The bill was outrageously high, and I saw no reason for it. Someone has been making a lot of money off us. We don’t want the meaningless spin and the constant selling permeating our home environment. Even what once seemed to have integrity no longer appeals. I see commercial television as a home invasion and I don’t want it or need it. There are other things to do. We recently cut the expensive car insurance we were paying in half by going with a different company, and our escalating health insurance premium by a good amount too by finding a new carrier. We weren’t getting better service for all our dollars, but some corporations sure were reaping huge benefits! We’ve put thousands of dollars a year back into our own pockets, money we can put to better use. Very local greens… from my yard! So, as I pare down my life, I stay local, as local as possible, REAL local. I support the efforts of my fellow human beings to produce real foods and goods and so I shop at the Red Hook Farmer’s Market and the Red Hook Natural Foods Store where local produce is always available. I simplify. 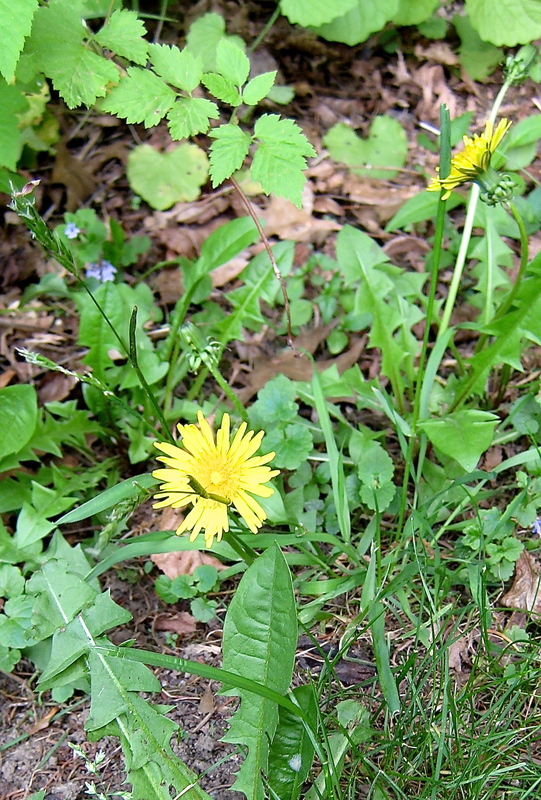 I eat the weeds in my yard. I constantly look to new places to pull the plug on the things I don’t need. It feels like a lot more people are doing this too. Local organic farms with everything from fruits and vegetables to meats and cheeses are growing in number, and it’s really good to see. I don’t see it as just a trendy thing, but more as a longterm trend toward taking back what we’ve lost: our personal power as real human beings. All of this local-ness is helping us regain our realness, our compassion, and a sense of social responsibility to the earth and our fellow human beings. It felt good to be out in the heat, planting my seeds, welcoming them to my soil. The birds sang to me all morning as I weeded and planted. The robin nesting in the rafters of the deck didn’t fly off her nest as I worked just a few feet away from her. She’s used to me now, she knows I’m real and that I won’t hurt her, that I’m just doing what she does, tending my nest, keeping it real. Previous PostReaders of Infinity: Room For ImprovementNext PostChuck’s Place: Energetic Fact or Phantom?